Vanderbilt Tower, 51" × 40". Sourced from Ludwig Mies van der Rohe and Philip Johnson’s Seagram Building and Le Corbusier’s Ronchamp chapel. We live in the age of the ­chimera—a world of relentless mixing in which anything and everything is a potential ready-made object available for copying, sampling, and versioning. Since the turn of this century, mashup has become part of our popular vocabulary; (we think) the term originated when DJs began using digital tools to make new tracks out of existing ones from disparate sources. Danger Mouse’s Grey Album of 2004, for example, combined the Beatles’ White Album with Jay-Z’s The Black Album. Mashup is the art of stealing and combining incongruous elements in order to ­construct new alignments and create new forms of legibility. Mashup is stealth collage, meaning that the cuts and seams between fragments are carefully puzzled together to the point of near disappearance. This tricks us into perceiving the work as a synthetic whole rather than a compilation of found parts. 6th Avenue and Pacific Street, 42″ × 78″. Sourced from Walter Gropius’s Bauhaus Building; Louis Kahn’s Yale Center for British Art; Marcel Breuer’s Whitney Museum of American Art; Herzog & de Meuron’s Eberswalde Technical School Library; Skidmore, Owings & Merrill’s Lever House; Sert, Jackson & Gourley’s Harvard University Holyoke Center; Marcel Breuer’s Grosse Pointe Public Library; Piano and Roger’s Centre Georges Pompidou; and Jean Nouvel’s Fondation Cartier. Despite the acceptance of mashup techniques in nearly every other medium, the dominant practices and theories of urbanism are still ruled by the modernist idea that cities should be built like machines: through the rational assembly of standardized parts. This approach too often results in generic solutions for generic cities. But the Fordist regimes of mass production are rapidly dissolving into networks of mass customization. The world has become a space of endless choices, options, and ­versions, and this applies to architecture and urbanism as much as to everything else. Variability, contingency, and hybridization are the key qualities of the mashup city. Their Atlantic Yards was a classic 1950s-style ­urban-renewal scheme, but repackaged in the kind of ­architectural glamour that became standard in New York during the height of the recent real estate boom. Though the project covered seven city blocks and ­twenty-two acres, Ratner hired a single architect to design one master plan for what was, essentially, a neighborhood. Concerned about the monoculture this arrangement might produce, our team proposed a polyphonic approach that cut the rail yard into eight smaller sites where different developers and architects could compete, communicate, and collaborate with one another and the public. Our design was for a landscape of difference: a heterogeneous space where the incongruous demands of real ­estate finance, local politics, street culture, and high architecture could be negotiated. The images presented here portray this landscape with manually cut-and-pasted imagery grafted onto a mixture of digital photography and graphics. They explore the idea of mashup urbanism by stealing ready-made architectural fragments from across time and space and ­reassembling them as visions of someplace else in an alternative future. As culture becomes increasingly fluid and hybridized, so does the urban landscape, producing situations for which conventional architectural thinking has few tools to either understand or confront. It is often remarked that architects have recently achieved an unprecedented level of influence on the future shape of cities. I doubt that claim is true, but, if it were, that power would not rest in built works but more likely in the pictures that we make in ­advance of construction. Such images have always had great power to shape the urban ­imagination. Developers, politicians, citizens, and ­builders determine realities. We, on the other hand, expand the possibilities, which is in fact a much larger field of operations. 1. Mr. Gehry resigned from the project in 2009. The firm of Ellerbe Becket was hired to redesign the basketball arena, and was later joined by SHoP Architects, who redesigned it yet again. The arena is under construction at the time of this writing. No one knows when or if the rest of the project will ever be built. 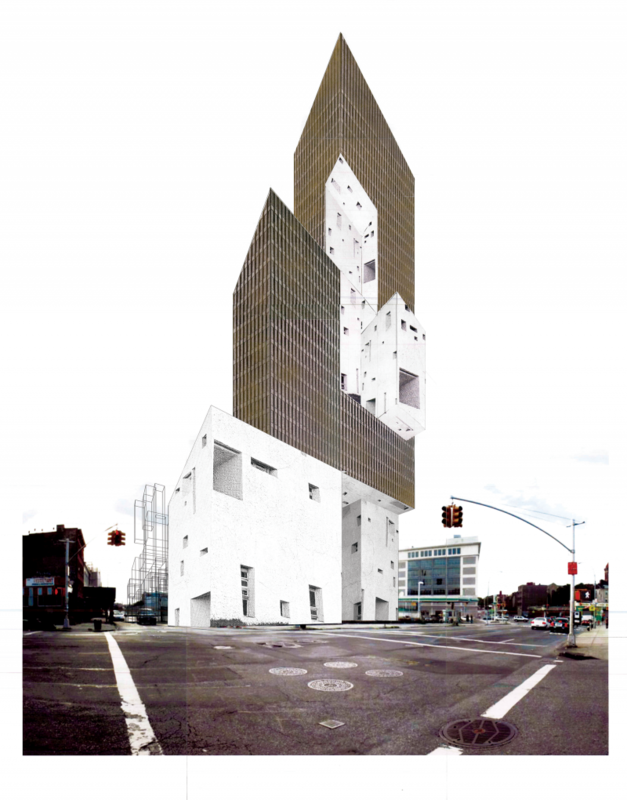 Marshall Brown is an architect, urban designer, and former resident of Brooklyn. Now based in Chicago, he hopes to design the Barack Obama Presidential Library. He is currently working on scenarios for the future of Chicago as a center of the world.